Starting price: $35.00 Plus Tax & Fees! 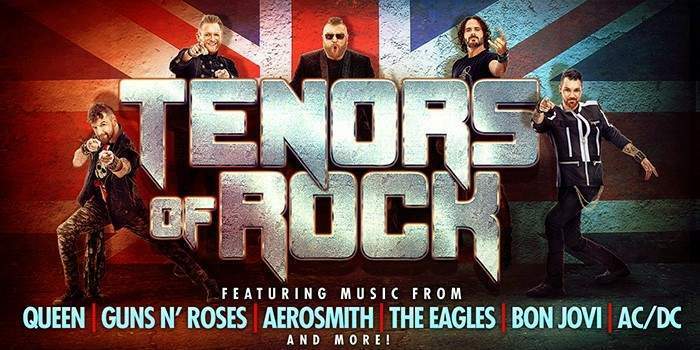 Formed with five of the best male rock voices in the United Kingdom, Tenors of Rock bring a new sound to familiar rock hits – you’ve never rocked like this before! From the original producer of “Rock of Ages” and visionary director/choreographers The Goldenboyz (Katy Perry, P!nk), Tenors of Rock is a full production show featuring classic and contemporary rock hits like “Sweet Child O’ Mine,” “Living on a Prayer,” “Back in Black,” “Whole Lotta Love,” “Here I Go Again” and more. For the best ticket prices for Tenors Of Rock, you can follow the link above this description and save $20 off Tenors Of Rock tickets starting at only $35!